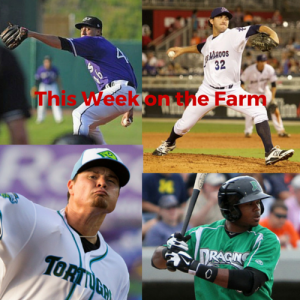 The MLB 2016 Draft begins this evening and the Reds have the 2nd overall pick which should produce some big time talent for the organization.Ã‚Â That also means that a few weeks from now we will also have the Reds two Rookie level teams beginning their season’s as well.Ã‚Â With that, let’s take a look at what has been going on recently down on the farm. 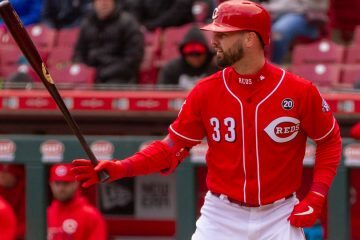 OF Jesse Winker (.285/.380/.366/.746) is swinging a hot bat again (.938 OPS in June).Ã‚Â Winker’s OBP skills will be a welcome addition to the Reds lineup when he is called up.Ã‚Â Scott Schebler (.252/.284/.408/.692) has caught fire as well in the month of June (1.346 OPS) to get his AAA numbers up to about league average.Ã‚Â Jose Pearaza (.288/.327/.379/.706) is still looking for his first BB in June in 33 AB. Cody Reed (3.31 ERA) and Robert Stephenson (3.47 ERA) are both pitching well.Ã‚Â The Reds pitching staff should get a big boost when these two join the roster within the next month or so.Ã‚Â Keyvius Sampson (1.88 ERA) has been throwing great since joining the Bat’s rotation.Ã‚Â Jumbo Diaz (0.00 ERA) has yet to be scored on at AAA. Brandon Dixon (.310/.360/.594/.954) had an incredible six game run where he went 15 for 24 with 8 HR to give his numbers a significant boost.Ã‚Â Dixon has cooled off a bit as he is hitless in his last 9 AB.Ã‚Â One has to wonder why 25 year old IF/OF Tony Renda (.319/.364/.459/.823) is still in AA and not at AAA getting the ABs going to 32 year old Hernan Irabarren.Ã‚Â OF Sebastian Elizalde (.318/.342/.449/.791) is hitting well since his return from the DL.Ã‚Â OF Phil Ervin (.246/.359/.425/.784) is putting up good numbers and seeing more time in CF. Amir Garrett (1.63 ERA) and Rookie Davis (1.66 ERA) seem positioned for promotions to AAA to back fill for when Reed and Stephenson get the call up to the big leagues.Ã‚Â Jackson Stephens (3.36 ERA) is pitching well at AA also.Ã‚Â RP Alejandro Chacin has a 0.76 ERA with 10 S but does has 15 BB in 23.2 IP. OF Aristides Aquino (.252/.317/.414/.732) continues to lead the Tortugas offense.Ã‚Â 1B Avian Rachal (.220/.355/.380/.735) is flashing some good on base skills.Ã‚Â OF Angelo Gumbs (.268/.324/.382/.706) is starting to swing the bat well again this month (.833 OPS in June).Ã‚Â Gumbs followed up a strong April (.803 OPS) with a poor May (.599 OPS). 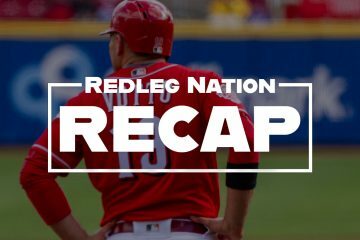 Keury Mella (2.64 ERA), Tyler Mahle (3.13 ERA), Seth Varner (3.28 ERA), and Tejay Antone (3.29 ERA) lead a strong rotation.Ã‚Â All four of these pitchers could be candidates for promotions to AA when the Reds begin making changes soon.Ã‚Â RP Jimmy Herget (1.71 ERA) has 9 S and 38 SO with just 8 BB over 26.1 IP. 2B Shed Long (.251/.332/.428/.760) is still the Dragons best hitter.Ã‚Â Long is showing good plate discipline and leads the club with 16 2B.Ã‚Â 1B James Vasquez (.235/.314/.413/.727) put up a nice May (.811 OPS) after a slow start in April (.679 OPS).Ã‚Â Vasquez leads the Dragons with 8 HR. Austin Orewiler (2.81 ERA) has emerged as the teams best starter since joining the rotation.Ã‚Â Jose Lopez (3.99 ERA) is pitching well also.Ã‚Â Lopez has recorded 62 SO with just 16 BB over 58.2 IP.Ã‚Â RP Ariel Hernandez (2.59 ERA)Ã‚Â has a 0.989 WHIP with 40 SO and 20 BB in 31.1 IP. Should the Reds Extend Zack Cozart? Tom, I’ve enjoyed and appreciated your inclusion of the league average stats as a reference to measure the individual player performances for the Reds prospects. I have not been able to find those league averages on my own. Can you point the Old Cossack in the right direction to obtain that information? Please and Thanks! What’s next the secret handshake? 🙂 Sure no problem. They are buried in baseball reference. Go to the following links for pitching and batting team org charts, scroll down past the depth chart section and find the team stats for each minor league team. At the bottom of the section for each teams stats you’ll find a line with the teams league averages for several stats columns. You can get them for previous seasons as well. It’s good stuff. I’ll continue to include them and the team records going forward, experiencing some technical difficulties this week and hopefully I won’t have to go all office space on my Windows desktop. Thanks so much Tom. I had literally spent hours trudging through BR looking for that info. I figured it was in BR somewhere, but dang if I could find it. Always informative Tom. Thanks. It’s great to see the ladder of pitching prospects in line behind Stephenson and Reed, and I suspect they know there will be room to move up as the Reds make change. This bodes very well for the long term. I’d like to echo the Old Cossack’s appreciation of the league average stats you furnish us. Tom who do you think the Reds select with the #2 selection tonight? I’ve been all over the board from Senzel to Lewis, to Pint, to Perez, and back to Senzel and Lewis. If signing below slot is a big consideration for the Reds, my sleeper pick is LHP Braxton Garrett. He just pounds the strike zone. With the 2016 draft imminently pending, I don’t think the #2 selection is as critical as the next 2 selections available to the Reds. Not that the #2 pick isn’t valuable or important, but there are 3-5 solid selections available at the top of this draft board and none of those 3-5 options really seperate themselves from the others as individually elite prospects. What this draft does seems to possess is depth behind those top 3-5 picks and this is where the Reds could really make hay with their next 2 selections. This draft is really a big part of the 2016 season so today takes on added importance, beyond the regular annual draft, for the future of the organization. I agree 110%. It is said that the top half of the second round will be many players that are first round rated. That bodes well at #35 and #43. You just never know who will be available when you get to those slots though. One caveat to watch tonight also, the Cardinals have 3 selections in between the Reds #2 pick and #35 pick. The Cards have picks #23, #33, and #34. Two selections just prior to the Reds #35 pick. That will be an interesting side bar to watch tonight too. I have no idea who they will take, but I hope it’s a polished hitter. I’m leaning toward wanting Senzel from what little I’ve read. Robert Stephenson may not be the answer. At least in the short term. We were at the game in Syracuse Monday night. His results were fine. Six innings, no runs, four Ks, two BBs and five hits, all singles. Not much to quarrel with there. We were sitting directly behind the plate. His fastball was consistently in the low 90s and often up in the zone. Topped out at 94-95. An OK fastball, but not consistently overpowering. He seemed to lack command of his off-speed pitches. Often went deep in the count and had to return to his fastball. The Syracuse hitters helped out. Several long outs and balls hit directly at fielders. Major league hitters would have feasted on him. I’m not saying he’ll never make it. This was only one night. But if Monday was a true picture of his skills today, it is hard to envision him as making any significant contributions this year. He has a long way to go. The luster from Stephenson has certainly diminshed over the past 2+ seasons since he began pitching in AA & AAA. Such is the travails of a minor league prospect, but I don’t think his status as a prospect has faded, just his status projecting him as a potential #1 starter in the major league rotation. His BB are up and his SO are down. He certainly needs to establish better control but I think he will fill a middle of the starting rotation slot going forward and his planned timetable will continue to be triggered this season with six years of team control after this season. He will just have to complete his development at the major league level. I don’t necessarily see that as a problem (see Hamilton, Billy) since he has demonstrated success at the AAA level and youth is certainly still on his side if he does stumble along the way. After all, that’s what options are for and there are more candidates lined up behind him. I’d have to agree that it’s time for Renda, who coincidentally has very similar career slash numbers as Iribarren, to take over on age alone. After the disaster that is the Reds 2016 bullpen, I would not necessarily be against filling out the 2017 Reds bullpen with the guys who miss out one of the rotation spots. It would be refreshing and reassuring knowing that whoever gets called out of the bullpen has the stuff and ability to get hitters out and throw strikes consistently Now we could argue whether it would be beneficial or stunt the growth of some of these guys that don’t make the rotation by putting them into the bullpen where they will not throw as many innings but at least get some experience and face major league hitting. However, that is not the point of me bringing up all these pitchers. I seriously doubt that the Reds would do this anyhow. The reason I bring it up is that the word log jam comes to mind when I look at all these names. Maybe Beaver Dam would be more fitting! 1. Who out of this group is the most likely to get traded before the start of next year? 2. Who would bring back the biggest return in a trade out of this list of pitchers? 1a. If he continue to pitch well, I think Straily might be the first to go. If DeSclafani was healthy I would probably put him high on the potential trade list as well. 2a. With the way they have been pitching it is hard not to be high on Reed, Garrett, and Davis right now. With all of the injuries and inexperience of the current rotation I just don’t know if any of those guys would bring more of a return than our top pitching prospects in the minors right now. From what I’ve seen Philly is probably going to take a hitter so the Reds will probably take Puk? Lefty throwing 97 sounds nice but personally I’m a little tired of the velocity hype? Homer/Stephenson were supposedly clocked at 99/100 in the minors but somehow lost 5-6 mph w/the Reds? I’d love to see them go with Senzel or Kyle Lewis? They might not be a Bryant with the Cubs but somebody that can fly thru the minors like that and give Votto some help before he’s on Medicaid is what we need! I’m calling it now, if Puk is there at #2, I think the Reds take him. That is assuming they don’t drop down on their wish list and draft someone who can be signed significantly below slot money. I agree, I think they take Puk at #2 if he is there. Slot consideration is one of the reasons that I don’t think they will draft Senzel (he would be my pick because, out of the top guys, I think he will be the closest offensive player to be MLB-ready by 2018). I read that Senzel is a Boras client, and if the Reds are attempting to sign someone for below slot in order to save cash for 35 and 43, drafting Puk or Lewis is probably the safer bet. Given the depth in pitching the Reds have built up in the last several years, I will be very disappointed if they take Puk at #2 overall and cop a plea about him being the best overall available guy. This would be especially aggravating given that in 2 of last 3 drafts they’ve taken college combination position guys/ relievers in round #1 with the intent of morphing them in starters and have little to nothing to show for it to date.. The mock drafts I’ve seen end with the #34 pick. I guessing this means the competitive balance picks won’t be made until Friday???? No. They are in for tonight along with the second round. They have the approximate times of each pick at the Cincinnati Enquirer story. Something like #2 is around 9:15pm, #35 around 9:58pm, and #43 around 10:15pm. am hoping the take senzel or mickey moniak. someone i trust has seen moniak a bunch and says he is sensational. senzel fills a need. think stephenson will be fine. want to see him and reed.